This is ONE pattern, that includes instructions for a two sided Topsy Turvy doll with 4 hairstyle variations (Long Full Hair, Side Braid, Up-do, and Curly Pigtails). 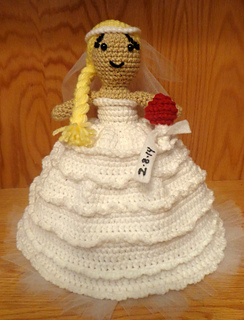 You can make it into a bride and flower girl keepsake doll, or a regular doll, by crocheting the gown on both sides, instead of using tulle. 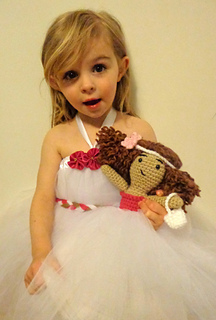 It also includes accessory instructions for a bouquet, flower basket, headband and hair flower. 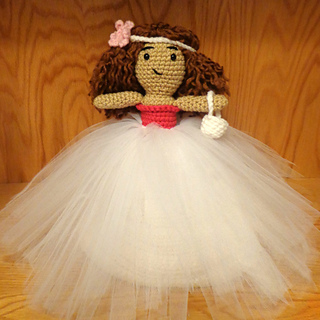 You can customize this as a gift to a special flower girl or bride, or for any special little girls in your life by choosing any hair, dress, accessory and skin color you desire. 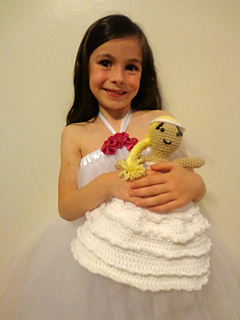 This pattern works up dolls approximately 13” (33cm) tall. It is in English and uses US Standard terms. 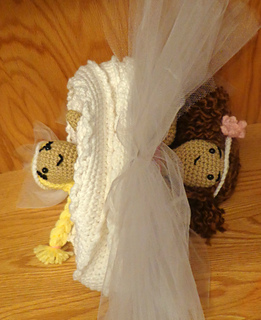 It includes photo tutorials, detailed instructions, and grants permission to sell the finished dolls. Photos are included to assist you, but please do not hesitate to contact me if you need additional help. Red Heart Super Saver or similar worsted weight yarn in the following colors: 1 Skein White OR Chosen Gown Color OR 2 skeins of Chosen Gown Colors (If you choose to make a doll without the tulle);Beige/Tan (or any skin tone color); Pink (Or any dress color); Yellow (or any hair color); Thick n’ Quick/ Chunky (in any hair color for long full hair). Eye Options: 8mm Safety eyes OR Stitch the eyes if doll is for child under 3. Optional Accessory Options: 6” long White felt strip or Ribbon; Black Fabric Paint or marker (To date the bouquet). Gauge is not essential to this project, but be sure that your hook size and tension creates a fabric without holes. You could also use a 3.75mm, but this may change the finished size.